One Year: We’re Gonna Win! Last year on this day, I spent most of the afternoon texting my friends in the City, trying to make plans for where to watch Game Five of the World Series. The San Francisco Giants had a chance to win it all in Texas that night. If they lost, they’d come back to AT&T Park and (we were sure) win in front of the home crowd. I was torn because I wanted my boys to win on their home turf, but more than that, I just wanted them to WIN! The San Francisco Giants had never won a World Series (the franchise had last won in 1954 when the team was in New York) and I desperately wanted it to happen during my first season back in San Francisco. Late that afternoon, it was announced that the game would be broadcast on a jumbo screen outside City Hall. I planned to meet up with my friends G and A to watch the game in Civic Center plaza with thousands of our closest friends. After work, I hopped a bus downtown and the crowd was already pretty large. I was able to find A on a small blanket with two of her friends and I squeezed into the small spaced the saved for me. The plaza continued to fill up, watching every pitch with held breath and chanting during every commercial break. 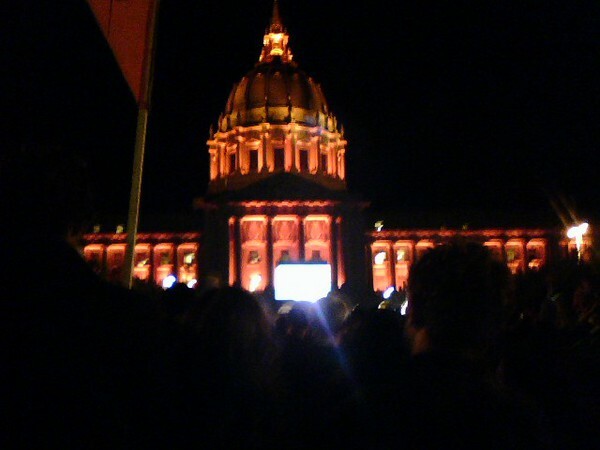 When the sun finally went down and cooled things off, City Hall was lit up orange, the way it had been every day since the Giants had made the playoffs. Even a year later, I can still remember Edgar Renteria’s three-run home run in the top of the seventh. The crowd went crazy and as we settled down to continue watching the game, I whispered to myself “We’re gonna win!” My stomach was in knots as the outs kept coming and the Giants stayed in the lead. Tim Lincecum pitched through 8 beautiful innings and Brian Wilson was up to close in the bottom of the ninth. I think we ended up standing through the entire bottom of the inning, counting every strike, cheering each out. There were about 10,000 people in Civic Center Plaza and when the last out came, the place just erupted. As Buster Posey jumped on Brian Wilson and the entire dugout emptied onto the field, I was jumping around, hugging A, crying, and high-fiving everyone around me. It seemed too good to be true, but there we were – the San Francisco Giants were World Champions and the City was ecstatic! The Giants twitter feed today had a lot of videos and memories from a year ago, stirring up all kinds of emotions. As I tried to get my thoughts together for this post, I wanted to capture the excitement, shock and delight that exited with that final out. However, unless you were there, on the grass in the dark as the jumbo screen provided the only light, it’s difficult to describe what that moment felt like. So I leave you with my favorite video of that night. I still get chills as I watch it get darker and know what happens next. The spirit of the city was indescribable last year. I remember muttering at the top of the 7th that the first team to score was going to win it. When Renteria hit that home run, I had no doubt. It was one of my absolute favorite nights, ever. I absolutely agree! It’s hard to believe it’s been a full year, especially when I watch the video because I just remember it SO vividly. I just want to re-live it again and again and again!